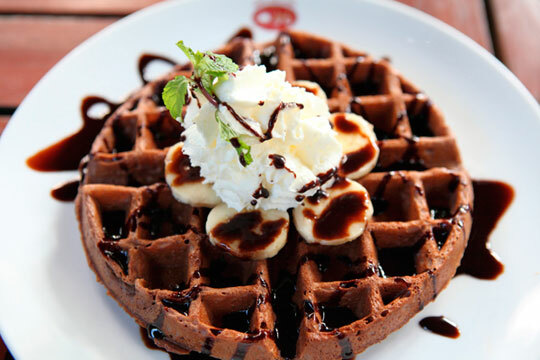 Kids will love having chocolate for breakfast, but these waffles also make a delicious dessert when topped with whipped cream or ice cream and berries. 1. Combine the flour, sugar, cocoa powder, baking powder, baking soda, salt and cinnamon in a large mixing bowl; whisk to blend. In either a large measuring cup or separate mixing bowl, combine the liquid ingredients and whisk to combine. Add to the dry ingredients and whisk until smooth. Fold in the morsels. 2. Preheat the waffle maker to desired setting (a tone will sound when preheated). 3. Pour a scant cup of batter through the top of the spout. When tone sounds, the waffle is ready. Carefully open the waffle maker and remove baked waffle. Close waffle maker and repeat with remaining batter. For best results, serve immediately.